winkydinks: Why use fleece covers? After a successful 4 year run, Winkydinks is no longer in operation. Please continue to visit the blog for green tips and other articles! Fleece offers a waterproof, but BREATHABLE, barrier between the cloth diaper and the outer clothing. While it is not a natural fiber, it is highly reusable (I've had some that are going on 2+ years old) and is very effective. (For some pros/cons between fleece and natural wool covers click here). 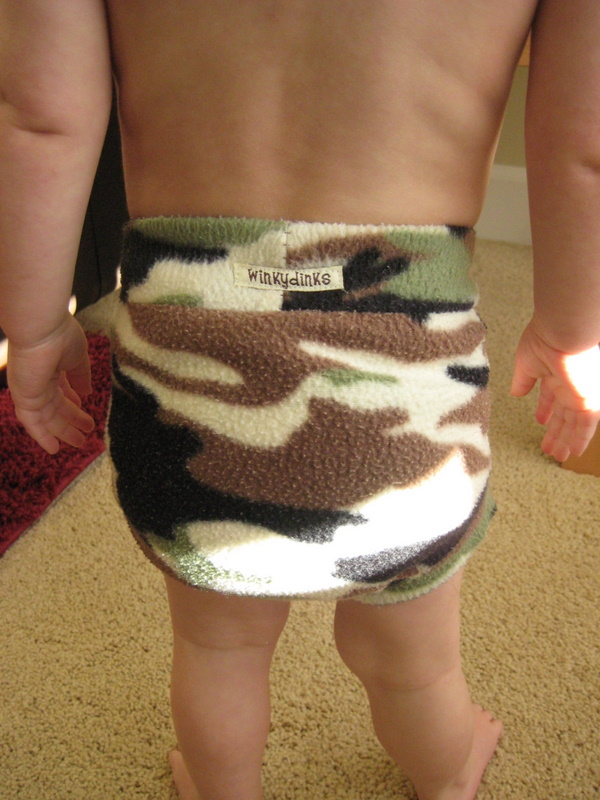 A fleece cover/soaker is used over a fitted, prefold, or flat diaper (or any non-waterproof cloth diaper). It can also be used as extra protection over a pocket, AIO, or disposable diaper. When being used over a waterproof diaper, it can only provide an extra layer before it hits the clothing - it cannot force the liquid back into the diaper to re-absorb. Make sure all edges of the diaper underneath are completely covered to get any extra protection in these cases. Fleece does not absorb anything. Without a diaper underneath, it will leak. Depending on the effectiveness of your diaper, you could get leaks out the legs of a fleece cover (for example, a poorly secured prefold diaper). Fleece can be washed with regular laundry or diaper laundry, with no special care (100% polyester won't shrink). Fleece does pill with wear (Click here for examples). Fleece offers a breathable barrier - this being said, you may feel "dampness" or humidity on your baby's clothing if you're getting used to fleece covers. It is not a puddle or a wet spot, but you feel the heat/moisture exchange a bit. To me, this is a good thing because you know your baby's skin can breathe! 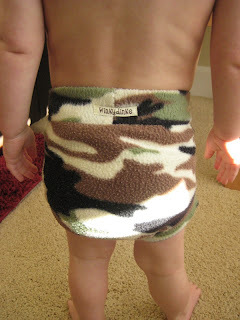 The more often you change the diaper, the more effective fleece will be for wetness protection. For night time, a soaker with a double layer of fleece in the wetzone is helpful and often gets babies through the night (again, depending on the diaper absorbency). There is also thicker fleece (200 or 300 weight) which provides more reliable protection (though a bit bulkier and more expensive). Some people find fleece is bulky under daytime clothing, compared to a PUL cover. However, for others, they are already sizing up in clothing to make room for a fluffy diaper :) In my case, it helped to keep the pants on my skinny 2 year old! Soakers can be worn on their own during the summer months with baby legs for a cute outfit! You can also get fleece shorties or longies that double as a cover and clothing at the same time. Fleece soakers on their own are not a suitable "training pant", since there is no absorbency. However, once children are at a stage where they stop their flow upon realizing they need to go, soakers can provide that extra layer of protection before it hits the clothing. (If they are still having full accidents, a soaker over training pants is not your best solution). There is a fabric called "eco fleece" that is made from 89% recycled pop bottles - great solution for an even more eco-friendly product (and it's the thicker, 200 weight)! If you'd like to see more fleece covers in action, visit my Facebook page to see customer photos! Do you have other questions about fleece as a cover? I'd love to hear! Leave me a comment. How often does a fleece soaker get used before needing washed ? Cayla - this is really a personal preference. Some people choose to wash them after every wear. If they are just repelling urine, I would alternate between two - let one dry (they will be a little damp depending on the wetness of the diaper), and use the other. I'd wash them usually after a day or two of use. You'll know when you want to wash them because they might start to smell since you can't just wipe them off like a PUL cover. If using for night time, I would wash every use. Stripe it Rich going Retail!